Depression or losing the baby weight are the more publicized concerns of the postpartum woman, but anyone who's had a baby knows how trying pregnancy is on the body, with long-lasting, painful physical effects involving muscle strain and misaligned bones. It's the kind of stuff that can't be fixed by getting back into a bikini three weeks after giving birth. Have you ever heard of "diastasis recti"? It's when the stomach muscles—the "six pack"—separates because they were ripped apart by the growing fetus. Sometimes it doesn't resolve itself. Today, the Wall Street Journal has a story full of post-baby body horror stories—just in time for Halloween! 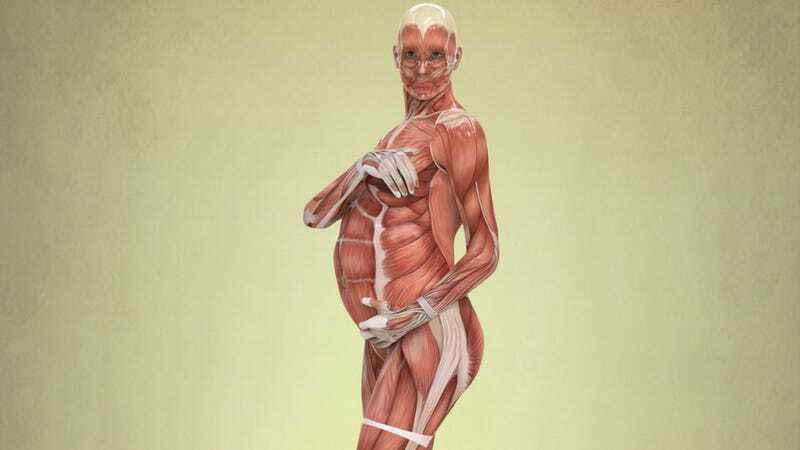 Abdominal muscles lengthen during pregnancy, spines become s-shaped, and there's something terrible which the pelvic floor, "the hammock of muscles in the pelvis that support organs and bones," tears. It may not even present itself immediately, but become worse over time. Almost 40% of women 60 to 79 years old report symptoms of some type of pelvic floor disorder, which includes incontinence and pelvic organ prolapse, when organs press against or descend into the vaginal walls causing a sensation of pressure, according to a 2008 study from the Journal of the American Medical Association. The more kids a woman has, the more likely she is to experience the symptoms.